FITNESS MANIAC Ladders are a great tool for developing quick feet, coordination and balance. To improve running speed, you have to increase frequency (the number of times the feet hit the ground) or stride length (the distance travelled in each step). The ladder enhances frequency by teaching athletes to fire their muscles faster. Start out with the basic movement patterns so the athlete is able to focus in on correct technique, with an emphasis on using the arms properly, flexing at the hips and not rounding the back. As athletes progress in the patterns, their running movement should be at the unconscious level so they do not have focus in on their technique and can focus in on the drill and how quickly they can move through it. With the increase in coordination, the muscles learn how to fire in the most efficient pattern, thus allowing the athlete to become quicker. Coordination also helps an athlete's neuromuscular system adapt to a wide variety of movement situations. ✅ It is great tool for you to improve quickness through accelerated foot strike and lift frequency. Plain, unmarked rungs with no insignias or logos. 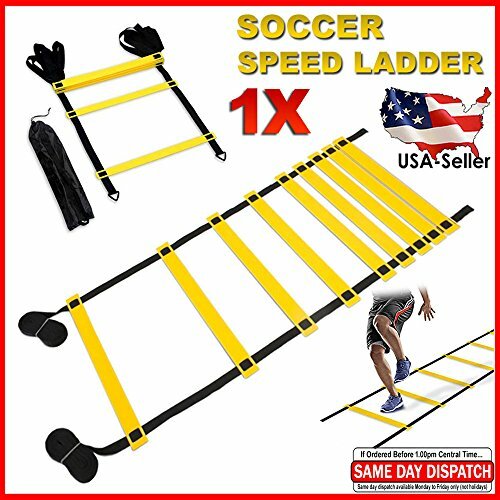 ✅ Each ladder ending has side-release buckles for connecting additional ladders to make one continuous ladder. ✅ Perfect for enhancing acceleration, flexibility, lateral quickness, rhythm and body balance/control. Improve coordination and speed by practicing foot work. ✅ Ideal for indoor or outdoor practice like those on a hard ground surface or meadow. Adjustable rung meets various needs. ✅ It has 9 Rungs. It is Included carry bag and handle. Available in Yellow/Black color combination. Comes as Single Speed Ladder. If you have any questions about this product by FITNESS MANIAC, contact us by completing and submitting the form below. If you are looking for a specif part number, please include it with your message.